Using acpidbg on Ubuntu 18.04 x64 can be quite handy; however, the Linux kernel with ACPI_DEBUGGER is not always available, such as on Ubuntu for ARM. In such cases, acpica also provides a set of utilities, named acpica-tools, for ACPI debugging. The latest source code can be downloaded from either of below, and it can be compiled and installed by “make” followed by “sudo make install“. The acpica-tools consist of the following utilities: acpibin, acpiexamples, acpihelp, acpisrc, iasl, acpidump, acpiexec, acpinames and acpixtract. 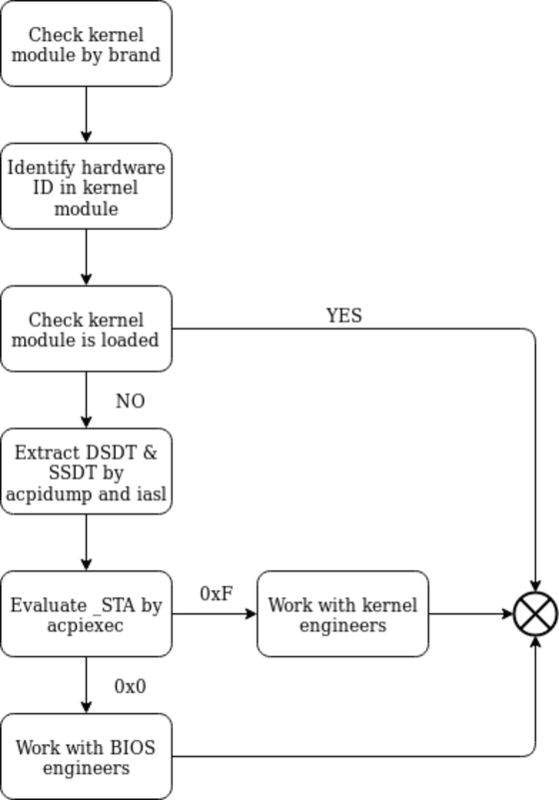 This article focuses on how to use iasl, acpidump, acpiexec and acpixtract because they are commonly used in debugging. The airplane-mode button on laptops is usually implemented by both system BIOS and an OS driver. More specifically, it requires an ACPI device to be “present” in DSDT (or SSDT) table and a corresponding device driver. The figure below demonstrates how to debug if the airplane mode button fails to work. Each computer brand has its specific implementation(s) and corresponding device driver(s). Some examples are listed below. Similarly, other driver source code can be found in Linux kernel. As seen above, the “intel-hid” is used on this particular Dell system. Let’s assume we know intel-hid is supposed to be used on this Dell system but it is not loaded for now. We can debug BIOS ASL/AML code using ACPICA utilities following the below steps. A quick online search shows intel-hid.c is for an ACPI device with _HID “INT33D5”. In addition to the device declaration, Linux ACPI device driver is loaded when _STA returns “present”. As in the above ASL code, _STA can be present (return 0x0F) or absent (return Zero). One can continue to trace OIDE() -> OSID() and so on to find out what _STA returns. Alternatively, using acpiexec is easier. Using acpiexec is the same as acpidbg, but it loads tables from files and runs AML in emulation mode, i.e. it does not touch hardware registers or actual memory. If _SB.HIDD._STA returns 0xF but intel-hid is not loaded, something is wrong with Linux kernel, ex. intel-hid is not compiled or is blacklisted. In this case, this should be forwarded to a Linux kernel engineer. ACPICA tools are very useful for debugging ACPI bugs, and using it well can save much time. This tutorial touches surface of what ACPICA tools can do and more documents can be found on acpica.org website.